Mel Brooks skewers every sci-fi movie imaginable - from Star Wars to Alien to Star Trek and even Planet of the Apes - in his hilarious parody Spaceballs. The evil leaders of Planet Spaceball task Dark Helmet (Rick Moranis) with taking every breath of air away from their peace-loving neighbor, Planet Druidia. 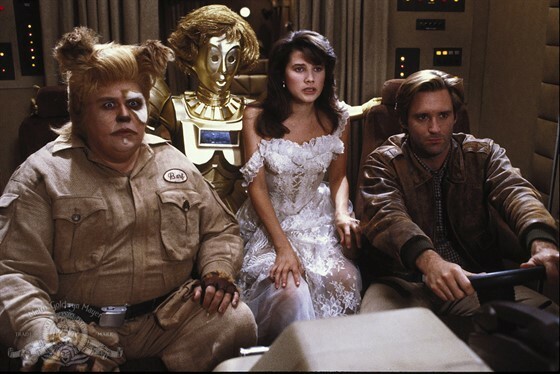 To do so, Dark Helmet kidnaps Princess Vespa on her wedding day for ransom but is foiled by dashing rogue Lone Star (Bill Pullman) and his sidekick Barf (John Candy). What ensues is a screamingly funny jaunt through the stars that will leave you quoting the film as easily as you do the films it spoofs – but you’d expect no less from Brooks, ever the master of farce and parody. Sit back, enjoy the ride, and remember: may the Schwartz be with you!